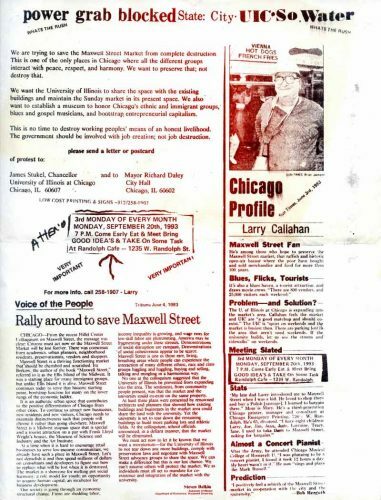 Larry Callahan, a printer and activist, organized regular meetings in 1993 to address and protest the demise of Maxwell Street. All images published by the Maxwell Street Foundation within this website are copyright of the artist and are for educational, personal, and/or noncommercial use only. For any other use, please contact gro.n1555621112oitad1555621112nuoft1555621112eerts1555621112llewx1555621112am@of1555621112ni1555621112.